Brian Manley joined the Austin Police Department in 1990 and has served as the Interim Chief of Police since December 2016. Chief Manley leads a department of over 2,500 sworn law enforcement and support personnel, with an annual budget of over $400 million. 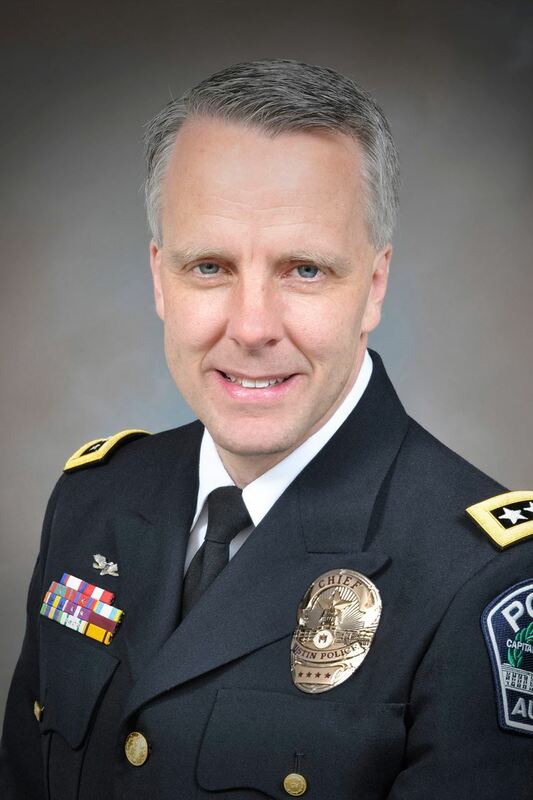 In his 28 years with the APD, Chief Manley has served in and led many areas of the Department, including Patrol, Narcotics, Child Abuse, Homicide, Highway Enforcement, Internal Affairs, Special Operations & Homeland Security, and Recruiting & Training. Having grown up in Austin, Chief Manley’s strong connections within the community have aided him in building and maintaining relationships across all of Austin’s diverse neighborhoods and with the many stakeholder and activist groups. Chief Manley believes in actively engaging the community to set priorities, sustain open lines of communication, and maintain transparency. Chief Manley has reengineered the department to better align operations with his commitment to community policing and improving the quality of life for all in Austin. Chief Manley attended the University of Texas at Austin, earning his Bachelor of Business Administration degree in Finance in 1992. He earned his Master of Science in Organizational Leadership and Ethics (MSOLE) degree from St. Edward’s University in Austin in 2004 and went on to serve as an adjunct professor in the St. Edward’s University Criminal Justice program. Chief Manley is a graduate of the Police Executive Research Forum’s Senior Management Institute for Police and the Major Cities Chiefs Association Police Executive Leadership Institute.